Wisconsin Fast Plants presents this guest blog as a contribution from a member of our sister program, Bottle Biology. 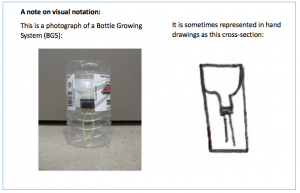 Bottle Biology projects encourage creative ways to grow plants, such as the bottle growing system, to promote science as a tool everyone can use to explore the world. This guest blog is provided by Bottle Biologist Joel Cryer. Thanks Joel! The BGS is well suited to classroom plant growth and experimentation in many ways – it is easy to make at low cost and is very modular. However, when one is working with large groups of BGS units, the separate water reservoirs can pose a maintenance problem. It is difficult to keep tabs on a dozen or more reservoir levels, particularly when the BGS units are kept under artificial lighting, which limits access to the bottles at the back of the light cabinet. This universal reservoir bottle growing system, or UBGS, resolves that problem but keeps the system modular by watering many bottles from one common reservoir. Important: Isolated reservoirs are a control in certain experiments. For instance, if the soil in two plantings is to be treated with differing levels of a water-soluble chemical, the UBGS would be a mistake, as it could result in transfer of the chemical between the two plantings. -Bottles: It is advised to start with single-serving bottles (0.5 L, about 20 oz) as these are often easier to source, and a UBGS built of larger bottles would be large for a classroom setting. Whatever size bottles you start with, ensure that the bottles are all as close to identical as possible. Also be sure you have a cap for each bottle. The number of bottles needed is governed by the tray selected as a reservoir (see below). If the reservoir is deeper than this, there will be wasted vertical space in the reservoir. If the reservoir is shallower than this, the final UBGS will have less water capacity than it could. However, the final UBGS will still work either way. The version shown uses a solid bottom nursery flat tray as a reservoir, but these can be hard to come by and are too large to fit into the Bottle Biology crate-based light boxes. Other containers will work fine as long as they approximately meet the standard for depth. If you identify a tray that is appropriately sized for the light box, please let us know and we can publicize it as a reservoir option. -Soldering Iron or Awl: This is the most hazardous tool this project requires. Always take appropriate precautions (safety glasses, for instance) and be extra cautious if you are working with children. If you choose a soldering iron, be prepared to get melted plastic residue on it. Older kids may be able to help with these steps but for younger children, make the holes beforehand and then have the kids help with the rest. -Zip ties. Choose zip ties that fit snugly but comfortably through a hole made by your soldering iron/awl. -Wick material. Many kinds of string work acceptably well. Braided nylon mason twine is recommended in that it is sturdy, relatively inexpensive, does not rot, and can be purchased at a range of hardware stores or online retailers. Avoid twisted mason twine which tends to come unraveled at the cut ends. -Soil, Plants and Fertilizer. Depending on your purposes, the plants selected could be Wisconsin Fast Plants, appropriate cuttings, or others. See the standard BGS instructions and the instructions for Discovery Cup Gardens, both referenced above, for inspiration. 1.Determine whether the UBGS is compatible with your experiment design/ curriculum (see Background section, page 2). 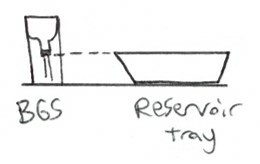 2.Select a tray to serve as the reservoir. Ensure that it meets the height standard (see above). Make only one bottle growing system for a test so as to avoid needless extra work later. 3.Gather your bottles. Arrange them in rows and columns in the reservoir tray such that the sides of the bottles touch. 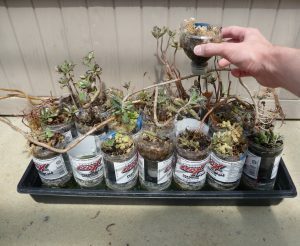 6.Remove the planter sections and wicks from the BGS units and set them aside. This can be difficult because the plastic at the bottom is sturdier. 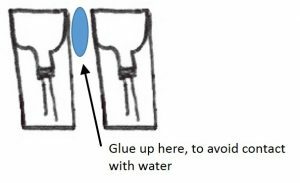 It is simplest to melt or poke a hole just above the bottom with your soldering iron or awl, and the cut around the bottom with scissors. 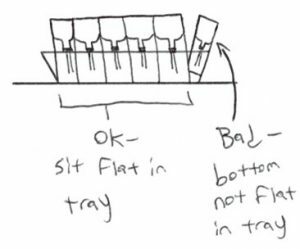 Don’t be too concerned about precision as the plastic is somewhat flexible and will accommodate the cylinder not sitting quite flat, etc. 8.Repeat Step 7 for all the individual bottle growing system reservoirs. 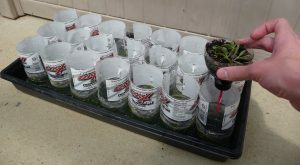 9.Place a planter section with wick in one of the plastic cylinders. 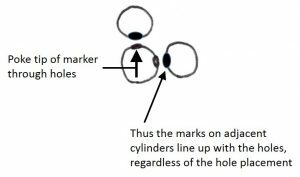 Using the permanent marker, make 2 marks on the cylinder, one about ½ inch above the other but with both well below where the planter section will sit. 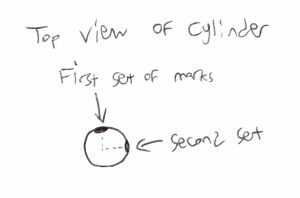 10.Rotate the cylinder and repeat Step 9. You should be left with a new pair of marks at about 90 degrees around the cylinder from the first set. 11.Remove the planter section from the cylinder. 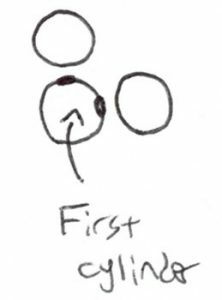 Use the soldering iron or awl to make holes at all four of these marked points. 12.Line up two more of the cylinders next to the first. 14.Poke holes in these newly marked cylinders with your soldering iron/awl. 15.Using zip ties, bind the cylinders together. When this step is completed you should have three cylinders zip-tied together in a triangle or right-angle arrangement, shown from above in Step 13. 16.Continue to work with the cluster of three cylinders. Measure, mark, poke new holes, and zip-tie new cylinders onto that cluster, repeating the process of Steps 9 through 15 as needed until your full array of cylinders is produced and zip-tied together. Both of these pictures are top-down views of the 3×7 array I made for my UBGS. The photograph on the left shows the actual array constructed. In the digital diagram on the right, each circle is a cylinder. The hash marks bridging the circles represent places where there are zip ties. As with the bottom cutting, do not be too concerned about precision with the zip-tying. The plastic cylinders retain a great deal of strength in the vertical dimension, yet once they are bound into an array the whole unit flexes to accommodate imprecise construction. 17.Place the cylinder array in the reservoir tray. 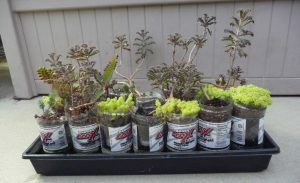 18.Add soil, fertilizer and plants/seeds to your planter sections one at a time, making sure to water from the top to start the wicking action (see standard bottle growing system instructions). 19.Place each planter section in the array until the entire array is filled with plants. 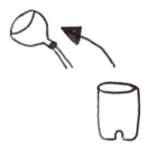 20.Move your Universal Reservoir Bottle Growing System to its final location before filling the reservoir as it is heavy once the reservoir is filled. 21.Fill the reservoir tray with water. 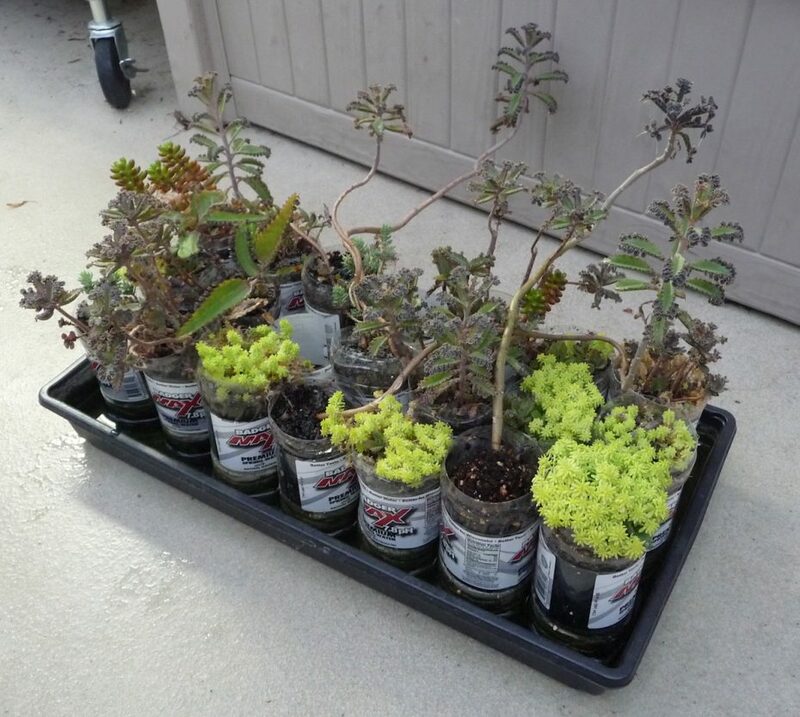 The planters should not shift around much during this process if the array is well-constructed. You’re done! Place your UBGS in a sunny place and enjoy it. Joel Cryer recently completed a bachelor’s degree in Biological Systems Engineering at UW-Madison. 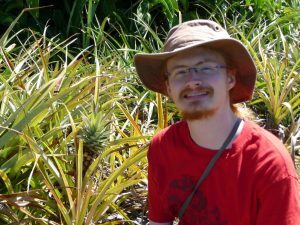 Through BSE, he combines his interests in engineering and plants in hopes of making agriculture more sustainable, perennial, and diverse. Joel has been building things out of found objects, discards, and other “trash” since he was young. In college that interest was revived and redirected when Dr. Paul Williams visited the GreenHouse Learning Community in Leopold Hall, where Joel lived. Dr. Paul ran a Bottle Biology workshop and engaged GreenHouse residents in hand-on learning with plant propagation and construction of Bottle Growing Systems. Joel and several fellow residents took that to heart and formed a Bottle Biology Club. 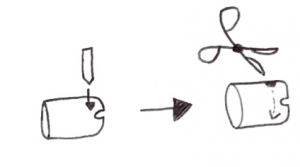 While some club members focused on outreach, sharing Bottle Biology projects with children at public events, Joel focused on the physical construction of the growing systems, jokingly saying he was “in Bottle Bio research and development.” These instructions are one result of Joel’s ongoing tinkering.